The Supreme Court today admitted and issued notice to the Central government and 11 States in a Public Interest Litigation (PIL) filed by Swaraj Abhiyan seeking necessary relief and compensation to drought affected farmers and other classes of citizens. According to the Petitioner organisation, it carried out a Samvedana Yatra across nine states from 2nd to 15th October this year to assess the ground situation resulting from the drought and also conducted an independent survey in 108 representative villages in the severely affected Budelkhand region of Uttar Pradesh which shows alarming figures: 39% families had not consumed dal even once in the last 30 days, 60% had not consumed any milk and 14% admitted going to bed hungry at least once during this period; 40% families had to resort to distress sale of their cattle, 24% had to mortgage or sell their land and 79% had to eat roti or rice with just salt of chutney at some point since the crop failure around Holi this year. The petitioner claims that this has been confirmed subsequently by various media reports, and that though it had addressed letters to Chief Ministers of various states to request urgent action on drought relief, they have failed to redress the misery of this vast population, they have even failed to properly implement the existing schemes that could have provided support during this period of distress. The petitioner has claimed that though the fact of drought is admitted by the Union of India and various states and that eight states have already officially declared a state of drought, the states of Bihar, Gujarat and Haryana have not yet declared a drought despite recording rainfall deficit of 28%, 14% and 38% respectively. 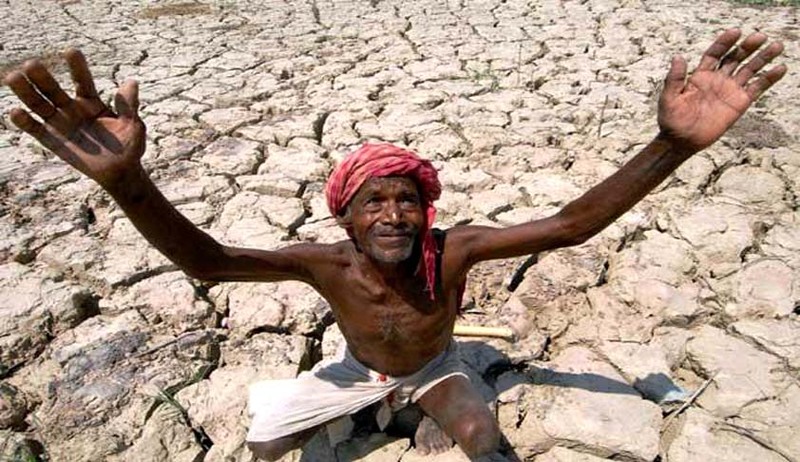 Slamming the states for their weak, ineffective and tardy response towards alleviating the conditions of drought affected citizens, the petitioner has made the startling claim that no government has provided any compensation or relief to the farmers for crop loss during this drought. The Swaraj Abhiyan has charged the states of being highly negligent in performing their obligations and accused them of causing enormous damage to the lives of the people due to their inaction. The petitioner has claimed that though the states are bound to give open handed employment of 150 days at the legal minimum wage for all willing to avail in the drought affected areas in accordance with the standard laid down by the respondents themselves under the MGNREG Act, 2005, they have failed to provide the same. Further, Swaraj Abhiyan, in its PIL has stated that the States have failed to implement the National Food Security Act, 2013 whose very purpose is to provide food security means and make available sufficient food-grains to meet the domestic at affordable prices. The petitioner has asserted that the negligence on the part of the Central Government and the State governments amounts to a contravention of the rights of citizens guaranteed under Articles 21 and 14 of the Constitution of India, and it has also charged the states with having abdicated their constitutional obligation under Article 21 of the Constitution of India which makes it mandatory for the Respondents to ensure the right to life of the citizens which includes the right to live with dignity with atleast two square meals a day. Seeking the intervention of the Supreme Court in such dire circumstances to alleviate the conditions of the drought affected people, the Swaraj Abhiyan has inter alia, sought for directions to the Centre and the 11 states arrayed as the respondents in the writ petition to : (i) declare a drought in their respective states and provide immediate essential relief and compensation to their people to tackle the present natural calamity; (ii) provide adequate and timely compensation for crop loss and input subsidy for the next crop to the farmers affected by drought; (iii) immediately make available and make timely payment for employment of 150 days under the MGNREG Act to the drought affected people, and (iv) immediately make available food-grains as specified under National Food Security Act, 2013 to all the rural people in drought affected areas irrespective of any classification such as APL/BPL; (v) restructure crop loans for damaged crops and other debts of farmers in the drought affected areas; (vi) to formulate uniform standard rules for the purpose of declaration of drought; and (vii) fix fair, objective and transparent package for crop loss compensation. After hearing the arguments of senior counsel Mr. Prashant Bhushan who appeared for Swaraj Abhiyan, a bench of the Apex Court comprising of Justice Madan Lokur and Justice S.A Bobde admitted the PIL to files, issued notice to the respondents for knowing their response and thereafter posted the matter to 04.01.2016.